In 1882, the Ross family, including James Taylor Ross (aged five), embarked on the long journey from Partick in Scotland to South Africa. The family settled in Durban where seventeen years later, James Taylor started a small business as a journeyman joiner. He was assisted by his father a patternmaker by trade. Initially James Taylor worked from his home in Windermere Rd (on the present site of Billy the Bum), but by 1902 the business had prospered to the degree where a move to premises at 58 First Avenue, Greyville became necessary. The move signaled the formal establishment of the company JT Ross (Pty) Ltd. 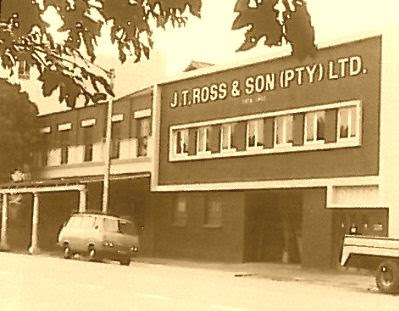 In 1920, James Taylor was joined by his son John Douglas and the company subsequently traded as JT Ross & Son (Pty) Ltd. In the years that followed father and son built up a sound business based on integrity, reliability and top quality workmanship. When James Taylor retired in the mid 1930’s, John Douglas took over the reins and continued to build on and enhance the reputation that had already been established. John Douglas was in turn joined by his son John Garth in 1955 and the following 15 years was a period of innovation and expansion. When John Garth assumed control of the business in 1970 he diversified and during the next seventeen years continued to further expand operations. Since 1987 the company has been under the direction of John Garth’s son Douglas Garth, thus continuing the proud tradition built up over four generations.